Wow Air has gone out of business, stranding thousands of passengers and creating potentially huge risks for Iceland's tiny economy and its growing reliance on tourism. The discount carrier is the eighth European airline to have failed since the summer as margins are pinched by fluctuating fuel costs and over-capacity that's sparked a continent-wide fare war. Wow's demise should bring short-term relief to local rival Icelandair Hf. Ryanair Holdings Plc, EasyJet Plc and Wizz Air Holdings Plc -- Europe's three biggest discount airlines -- also fly to the island in the North Atlantic, whose popularity has grown exponentially in recent years thanks to television shows like Game of Thrones. All 29 of Wow's flights scheduled for Thursday were canceled and 2,700 passengers were asked to check with other airlines to get to their destinations. The government activated contingency plans and issued a statement seeking to offer reassurances about the consequences for the local economy. "We have run out of time and have unfortunately not been able to secure funding for the company," Chairman Skuli Mogensen said in a letter to employees. "I will never be able to forgive myself for not taking action sooner." Wow had earlier said it was in the "final stages" of raising new equity from a group of investors, telling passengers flights had been postponed until "documentation with all parties involved have been finalized." But those talks ultimately failed. Passengers are advised to check available flights with other airlines. Some airlines may offer flights at a reduced rate, so-called rescue fares, in light of the circumstances. Information on those airlines will be published when it becomes available. Along with Icelandair, Wow has played a key role in the country's decade-long boom in tourism, which is now its biggest export. The closely held airline carried 3.5 million passengers last year. Its crisis has weakened the krona (the currency fell as much as 1.44 percent on Thursday alone), triggering cabinet meetings that saw the government rule out a rescue using taxpayers' money. "This announcement comes at bad time for the Icelandic tourism sector, which is now preparing for the high season," Gudjonsson said. "The krona has already weakened some 11-12 percent, and measures have already been taken both within the companies and by the government to react," Bentsson said. "Our tourism sector has untapped opportunities for the future and we are capable of reacting to this kind of a blow," Benediktsson told local television network RUV. 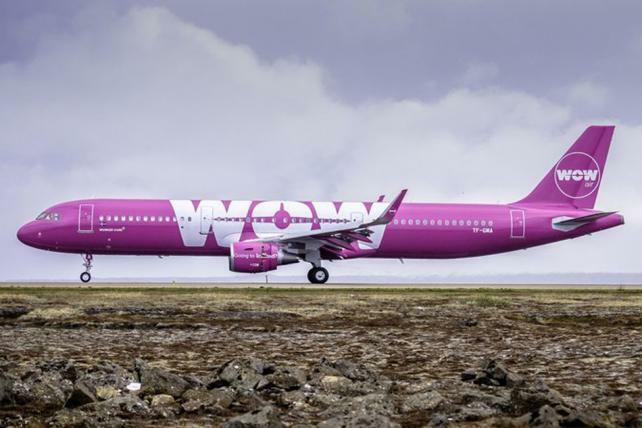 Connections to North America could be worse hit by Wow's collapse, although Icelandair, which serves more than 20 locations in the U.S. and Canada, would be expected to pick up the slack. Belgium's VLM announced its liquidation in August, when Switzerland's Skywork Airlines AG also ceased flights. The German arm of Small Planet filed for insolvency in September, with Azur Air halting operations in the country, and Nordic leisure carrier Primera Air collapsed on Oct. 1.